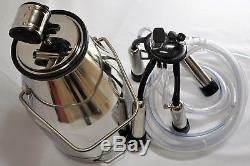 Controlled Portable Complete Milker Machine with 5.5 CFM Oil-less Vacuum Pump, 25 Liter SS Milk Pail Bucket, Pulsator, Claw Cluster and all the air and milk Hoses included. 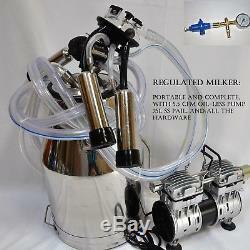 This is the Milker MWP5 with vacuum control regulator and gauge kit. Just make a few connections, you are ready to milk cows one at a time. 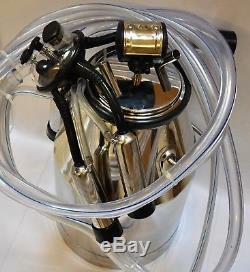 Portable Cow Bucket Milker Machine with the vacuum pressure control regulator:5.5CFM twin piston vacuum pump, gauge, 25 Liter SS Milking Pail bucket, Claw cluster, Pulsator, Shells and Liners, the air and milk Hoses. Just make a few connections of the hoses, you are ready to milk cows, one at a time, no oil-mist problem! Come with 5.5 CFM oil-less twin piston vacuum pump with 1/2 barb intake port. Milker Bucket: SS 25 liter bucket with lid and liner. 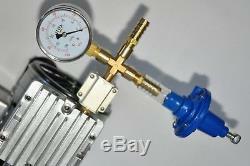 Vacuum Control Regulator Kit: VGRKb for pressure monitoring and regulation. Milk Claw Cluster: Include the following components. Claw model MC: bottom unload clear bowl with 150ml capacity, 9 liter/min large flow capacity. 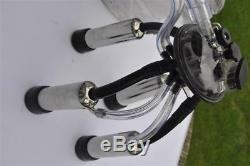 4X Teat cups: SS with 4X matching rubber liners, and the 4X short hoses. 5 feet 1/2 ID 3/4 OD thick-wall vacuum hose to connect the vacuum pump to the milk tank. 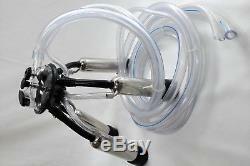 9 feet 5/8 ID thick milk hose, and 9 feet double pulsation air hose to connect the pulsator to the milk claw. All parts are brand new, rubber parts are stretchable. 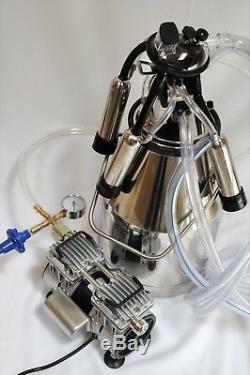 Twin-piston oilfree vacuum pump 3/4 HP, 5.5 CFM: 1 unit. Milker Bucket; 25 :liter SS with SS lid and rubber seal, 1 unit each. 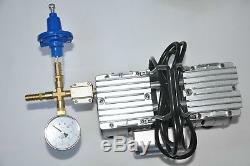 VGRKb Kit: 1 unit(include these part: Vacuum regulator and gauge, a cross adapter, and a few other adapters). Pulsator: P80(L80) 1 unit. Cow milking claw Cluster: 1 unit, come assembled together with these parts. CLaw: 240 ml bottom unload, 1 unit. Shells/teat-cups, stainless steel: 4 units. Matching rubber liners: 4 units. Short air hoses: 4 units. 9 feet 5/8 ID thick milk hose: 1 unit. 9 feet double air hose: 1 unit. 5 feet 1/2 ID thick vacuum hose: 1 unit. Regulation Hardware Kit: 1 unit, come assembled with these parts. Brass Cross adapter, 1/4 MNPT X (3) 1/4 FNPT, 1 unit. Brass adaptera, 1/4 MNPT X 1/2 Barb, 2 units. Short 1/2 ID PVC hose, 2 inch, 1 unit. Add a map to your own listings. The item "Regulated Complete Cow Bucket Milker OIL-LESS Vacuum Pump Pulsator Claw Cluster" is in sale since Sunday, April 22, 2018. This item is in the category "Business & Industrial\Agriculture & Forestry\Livestock Supplies\Cattle - Dairy". The seller is "viot_hvac" and is located in Champaign, Illinois. This item can be shipped to North, South, or Latin America, Australia, United Kingdom, Denmark, Romania, Slovakia, Bulgaria, Czech republic, Finland, Hungary, Latvia, Lithuania, Malta, Estonia, Greece, Portugal, Cyprus, Slovenia, Japan, China, Sweden, South Korea, Indonesia, Taiwan, South africa, Thailand, Belgium, France, Hong Kong, Ireland, Netherlands, Poland, Spain, Italy, Germany, Austria, Israel, New Zealand, Singapore, Switzerland, Norway, Saudi arabia, Ukraine, United arab emirates, Qatar, Kuwait, Bahrain, Croatia, Malaysia.